There is no more parochial view, no greater hubris, than that which asserts that the universe was created precisely to have one in it and simultaneously decries the honest enquirer who says 'I don't know' as arrogant. It's a truism that the theist needs to know, while the atheist is happy not knowing. Is it actually true, though (Go on, Mr Betteridge; have at it)? Your mission, should you choose to accept it, is to follow me down the rabbit-hole of apologetic which, for today, is a particularly pernicious one, not least because of how widespread misuse of a particular term is; knowledge. On the face of it, the positions at the head of this post look fairly unobjectionable but, once you delve into the semantic content of those phrases, some problems come to light, and I thought that elucidating those problems might prove instructive. Before I do that, it will be helpful, I think, to draw a clear distinction between knowledge and belief. Many philosophers and thinkers will define knowledge as 'justified true belief', and will say, therefore, that knowledge is a subset of belief. I know that Matt Dillahunty has said that he finds the former problematic, but has expressed his assent to the latter. I actually find them both problematic but, of course, it's a purely semantic issue. That it is a semantic issue doesn't mean, however, that we can simply dismiss it. Indeed, I'd argue that it's precisely because it's a semantic issue that it needs to be fully explored, so that we can be clear about what we're saying. I've said before that I don't do belief. This might seem on a cursory assessment to be a silly statement and, in fact, if you define belief in certain ways, it definitely is, but there's a reason I say that. If you define knowledge as a subset of belief, or as 'justified true belief', then of course I have beliefs, but there's always a huge danger of equivocation in accepting a without question or qualification. The issue is, for me, that 'belief' is such a broad term, applied to such a disparate range of concepts, that it's almost impossible to know what somebody is talking about when they use it unless the context defines it. It's semantically ambiguous at best which, in my estimation, renders it misleading and, ultimately, without utility. For almost the entire spectrum of concepts to which the term is routinely applied, there's a much better, far less oblique term that more accurately describes the concept. Thus, I draw a firm distinction between knowledge and belief to ensure that what I say isn't open to equivocation. So, I define knowledge as 'acceptance of that which is demonstrably true' and belief as 'acceptance of that for which there aren't sufficient data to demonstrate truth', and I have no use for the latter. That's not to say, of course, that I have no hidden beliefs that I would define in that way. I'm not a machine, and there are no doubt some things lurking deep down in my psyche that colour my perceptions of the world and that are unwarranted but, as they become exposed as beliefs, they're either supported or discarded, much the same as any claim I might encounter from somebody else. Matt Dillahunty has a go-to phrase that he put on a t-shirt, "I want to believe as many true things and as few false things as possible", which is a nice, pithy way of expressing much the same thing. I would say that I want to know as much and believe as little as possible, now that all danger of equivocation has been removed. I'd probably go so far as to say that treating knowledge and belief as residing on the same spectrum is problematic. In my opinion, both knowledge and beliefs are complex functions of two independent spectra. Here's a crude graph to show how I think about these things. There isn't really an easy way to represent these ideas, because they are necessarily somewhat fuzzy, and we've seen before the dangers in thinking in dichotomies, but this should be reasonably clear. In the upper-right and lower-left corners, we have knowledge, denoted 'K'. The upper-right represents the things we know to be true, things demonstrated to be the case. Facts, in other words. In the lower-left corner, we have things we know to be untrue. This is where we have falsified theories and hypotheses and all things demonstrably not in accord with reality. 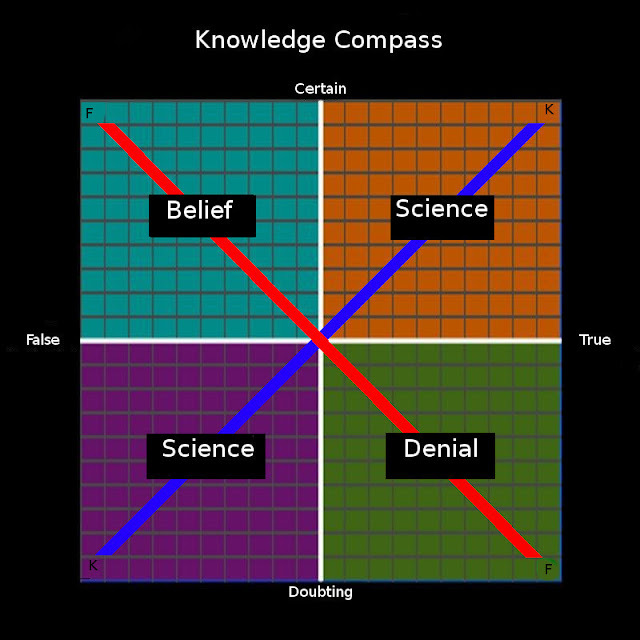 Knowledge resides on the blue line, with differing degrees of certainty apportioned to the evidence available. The red line represents belief, with the extremes of belief denoted 'F', for faith. There is, I should note, a slight danger of lack of clarity here, precisely because of that fuzziness, because it isn't the case that all things one might have faith in are untrue, or that faith represents falsity, but what I'm trying to show here is that belief and knowledge are qualitatively different things. It's easy to see where the confusion arises, of course. We treat knowledge as a degree of certainty, and certainty as a degree of belief. However, we must, of necessity, treat certainty separately from truth. You can be 100% certain of the veracity of a proposition and still be wrong. Similarly, you can be 100% certain of the falsity of a correct proposition. Now, it's often said that science is never certain about anything, which would tend to suggest that there should be no place for certainty when discussing science but this, although pithy and somewhat useful generally speaking, doesn't get to the nub of the issue, and can be a bit misleading. There are many things that scientists are justifiably certain about. I made a meme some time ago that has enjoyed a little popularity dealing with the hierarchy of epistemology in science. It was made to deal with another ubiquitous apologetic misrepresentation, and it's probably useful to bring this hierarchy to light here, as it shows how the boundary operates in practice. A fact is a data point; something observed to be the case. An hypothesis is a guess; an attempt to explain what is observed to be the case. It's essentially a machine for generating predictions about what future observations should reveal if the hypothesis is correct and what, if it is observed, will show the hypothesis to be incorrect. A law is a description, usually mathematical, of some observed behaviour or some relationship between observed quantities. A theory is an integrated explanatory framework encompassing all the facts, hypotheses, laws and observations pertaining to a given area of interest. Facts constitute knowledge. When we observe something to be the case, we can say we know it. The Shannon information content of an observation is 100%. There are no reductions in certainty. Let's take evolutionary theory as an example. Darwin started out by observing that the anatomy of a closely-related family of birds varied with environment. These are facts, and they will always be facts. From these observations, Darwin formulated a hypothesis that the differences were directly correlated with the differences in environment, and that the environment was, therefore, having a direct impact on morphology (loosely, differences in shape). This was natural selection in a nutshell. His hypothesis was that the differences in morphology were a result of different environmental pressures in terms of availability of subsistence resources, etc. He worked out what this would imply, and then set out to see if those implications could be observed elsewhere. Every organism is the same species as its parents and its offspring*. This one is a statistical law, known as Dollo's Law, and it deals with the negligible probability that an evolutionary pathway can be back-tracked perfectly. Sometimes, this is taken to mean that ancestral traits can't re-emerge, but this view is wrong. There are other laws, of course, such as Mendel's Laws of Inheritance. The important thing to take away about laws is that they're not prescriptive, but descriptive. They describe observed relationships between quantities. There's a popular trope that, once theories have been proven, they become laws. This is simply untrue, because theories are never proven, and they never become laws. See footnote for a link to more on this, specifically in the context of evolution. Finally, we come to theory, which is the integrated explanatory framework encompassing all the facts, hypotheses, laws and observations pertaining to a given area of interest. When we look at the countering case, of course, what we see is an assertion of certainty masquerading as knowledge. In the case of the sceptic, she does need to know, but she prefers ignorance to false certainty. In summary, the truism at the top of the page should properly read 'the theist needs to be certain, while the sceptic needs to know'. *In Has Evolution Been Proven? we looked at the various concepts of species and why we use the biological species concept, and also the importance of a temporal component to any species concept. Here, I want to introduce two terms into the discussion to deal with two types of speciation. I would hope that these don't require explanation, but then we come across the common question from creationist apologetics 'if we evolved from apes, why are there still apes', which really exposes the depths to which ignorance of evolutionary theory sinks, and it's depressing to me that there are still people around who genuinely think this question is problematic for evolution. So, the first of these types of speciation (there are others, but we don't need them for our purposes here) occurs when populations diverge genetically, or split into separate populations. This is known as sympatric speciation. Under other circumstances, populations will diverge from their ancestral populations due to the accumulation of differences over time. This is known as allopatric speciation. The question, as posed, assumes that all speciation is allopatric, which is the only reason to think that any group of organisms from which we evolved would necessarily be extinct. This is, of course, not a postulate of evolutionary theory.